HUTA Bargot was a kingdom in Mandailing, North Sumatra. The king was Sutan Pulungan. He had a wife and one baby boy. The king loved hunting. One day, the king and some soldiers went to the jungle to go hunting. The king also brought his dog. The king and his soldiers were in the jungle. Suddenly, the dog was barking then ran very fast. The king ordered his soldiers to follow the dog. "Hurry! Maybe the dog is chasing a deer!" The soldiers immediately ran after the dog. Finally they were able to find the dog. Strangely, the dog was barking at one big stone. The soldiers carefully approached the big stone. They were surprised! They saw a baby boy was lying helplessly on the stone. When the king arrived, he asked his soldiers. "Where's the deer?" He still thought that the dog was chasing a deer. "Your Majesty, the dog did not chase a deer. Look!" one soldier pointed at the baby"
The king slowly approached the baby. "Bring the baby now. He is not safe here." One soldier carefully held the baby. When they arrived in the palace, the king ordered the soldier to give the baby to Saua. She was an old woman who lived alone. Saua was so happy. She was lonely and she hoped that the baby boy would make her life happy. Unfortunately, Saua did not have enough bed for the baby. So she put him inside a dog cage. Because of that, people called the baby boy as Baroar, which means the dog cage. Baroar grew as a handsome boy. Strangely, he exactly looked like the king's son. Baroar's looks and behavior were exactly the same as the prince's. People could not tell the differences between the two boys, therefore, they were always mistakenly treating him. They paid their respect to Baroar and ignored the prince. This condition really upset the king. He really hated Baroar. He even had a bad plan. He wanted to kill Baroar during a ceremony in his palace. There would be lots of noise during the ceremony and he hoped no one would hear when the soldier killed Baroar. "Remember, you have to mark Baroar's forehead with an X sign. It's to tell you that he is Baroar and not my son!" ordered the king to his loyal soldier. The soldier understood. So he immediately went to Baroar's house. He.brought Baroar to the palace and later gave,him an X sign on his forehead. When they arrived, the prince saw Baroar with an X sign. He wanted to look like Baroar, therefore he also marked his forehead with an X sign. When the ceremony began, the soldier saw the prince. He thought the prince was Baroar because there was an X sign on his forehead. He killed the prince! Later he buried the prince. After that he told'the king that he had killed 'Baroar'. After the ceremony was over, the king was looking for his son. He could not flnd him. The king began restless. He had a bad feeling. He asked his soldier to go to Baroar's house. Well, the soldier found Baroar. He felt very scared. The soldier planned to kill Baroar. Fortunately Baroar and his step mother were able to escape. The soldier followed them. 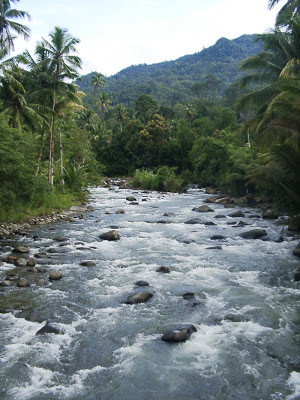 Baroar and his step mother arrived at Batang Gadis River. Baroar saw one big log floating at the river. He swam and brought the log to the side of the river. He asked his step mother to sit on the log and slowly crossed the river. They arrived at the other side of the river safely. When the soldier arrived, he could not cross the river. The water was too high. He did not have anything to cross the river.